Minimum Specific Gravity: 0.40. 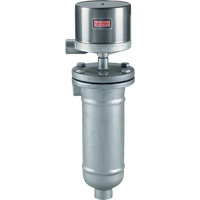 Process pressure 1000 psig (69 bar) at 100°F (38°C); 850 psig (59 bar) at 475°F (246°C). Switch Type: Snap action or mercury. See Model Chart. Wiring Connections: G, WT or E enclosure: terminal block; EV enclosure: 18" (460 mm) leads. Process Connections: 1" NPT or flanges. See Model Chart. (1" socket weld hubs optional). Enclosures: G: painted steel and aluminum; WT: painted steel, aluminum, neoprene; E: aluminum; EV: aluminum, neoprene. Wetted Parts: C1 construction. Chamber, carbon steel. Trim 303SS, 304SS, 316SS and 430SS. Weight: 1221: 64 lb (29 kg); 1223: 74 lb (33.6 kg); 1224: 81 lb (36.7 kg). EXAMPLE 1221 WT 7810 C1 40 1221-WT-7810-C1-40 Liquid Level Control, weatherproof enclosure, SPDT snap switch, fixed deadband, automatic reset, operating pressure 1000 psig (69 bar) at 100°F (38°C), 850 psig (59 bar) at 475°F (246°C), side/bottom process connections, 1" NPT, minimum specific gravity 0.40.